Dan's eyes popped open at 2:50am, he lay in bed until 3:50 before getting up. I joined him at 4:30. I had a lot of cooking to do before Jonathan came over to get the bed. 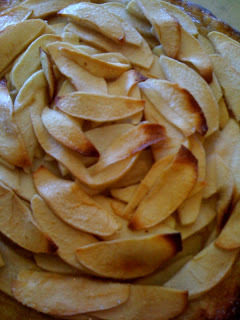 I had to ice the cake, roll out the tart dough and fill it with thinly sliced cinnamon and sugar laced apples before popping it into the oven. I needed to make the spicy sausage dip, scalloped potatoes (more thinly sliced things), coleslaw and package up the sangria. In order to make the birthday cake more elegant I wanted to slice the 2 cakes in half so there would be 4 layers. I sliced the first cake in half and found the center raw. In a mild panic, I thought I could use a large biscuit cutter to cut out the center, it kinda worked. The second cake was really raw. I sent Dan to the store to get what I needed to make the cake again while I tried to roll out the tart dough. Resting in the refrigerator over night, it hadn't come together, it was way to dry. 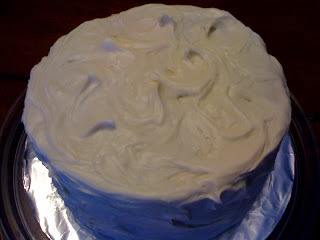 I remade the dough and left it to rest for an hour while I remade the cake. Lesson? I can't cook worth a darn on 4 hours of sleep! With the cake cooling and the tart in the oven I made the coleslaw while Dan made the dip. Jonathan came over and I finished things up while he and Dan loaded the bed and brought the desk and cedar chest down for easier removal later. We sat around for an hour or so and caught up, he making us laugh with his tales of woe in the women department. I am really going to miss him, he is so forthright, funny, honest and kind, a really great person to be around. Now we were running late. Dan washed and peeled the potatoes while I got the sauce ready, I sliced them on my handy mandolin, put the whole concotion in the oven and went to take a shower while Dan loaded everything in the jeep. We stopped at Starbucks, tired from not getting a chance to nap, and arrived at Greg and Barb's at 3:15, only 15 minutes late. Stepping into chaos and loud voices, I hurriedly set out the dip, bread and sangria so we could snack and got the potatoes warming in the oven and the coleslaw in the fridge. Barb's parents were there and we all struggled to hear each other as the kids ran around happy to have the whole family there. A soccer mom dropped Gracie off from her game and her and Dan talked about Kauai while I went over the details of the next few days with mom and dad. Greg went all out on the protein; mussels, salmon, halibut, crab legs and steak. As we sat down to celebrate mom and dad's 80th birthday (his January 13th, hers February 13th) the neighbors joined us. It was a fantastic dinner, happiness and camaraderie in abundance. 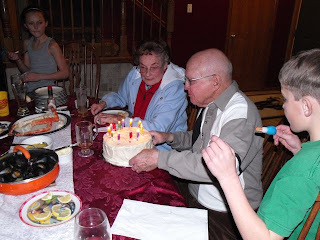 The birthday cake and tart were brought out as we all sang happy birthday and mom and dad blew out the candles. Joyfully eating sweets, we talked about our move. The neighbors were really supportive and got the whole reason why we were moving. I was glad mom and dad were there to hear it because that is the normal response we get. When dad tells his friends, he gets the opposite. We were the last to leave, at around 7, when Gracie jumped into our arms and said she was going to miss us. We said our final goodbyes and headed home, happy that it worked out so well. To bed at 9 and fast asleep.